For the 2009-2010 and 2010-2011 academic years, SUSD reported no pay increases. And teacher compensation increased, on average, over 8%. How can this be? Despite the 0% change, the average schedule salary paid (column circled in the center) increased from $75,808 in 2008-2009 to $79,566 in 2010-2011. This is an average increase of $3,758 or 5%. However, this 5% pay increase was reported as 0% because the underlying pay scale remained the same. The teachers moved to higher seniority steps and to higher college credits columns resulting in higher pay from the same pay schedule. From the 2008-2009 academic year to the 2010-2011 academic year, SUSD’s insurance costs have gone up $3,426 (32%) compared to the state average of $743 (8%). Comparing the 2010-2011 academic year to the 2008-2009 academic year, SUSD’s average pay and insurance benefits have increased $7,184 (8.3%) compared to a state average of $1,669 (2.2%). Supplemental Pay. The state salary data represents scheduled salaries only and excludes salaries for summer school, bonuses for special accomplishments or payment for extra-curricular services such as coaching, drama, or music. Bonuses for master’s or doctorate degrees are included by some districts and not others. Because SUSD has not provided its employee compensation data to the San Jose Mercury (available at http://www.mercurynews.com/salaries/bay-area. 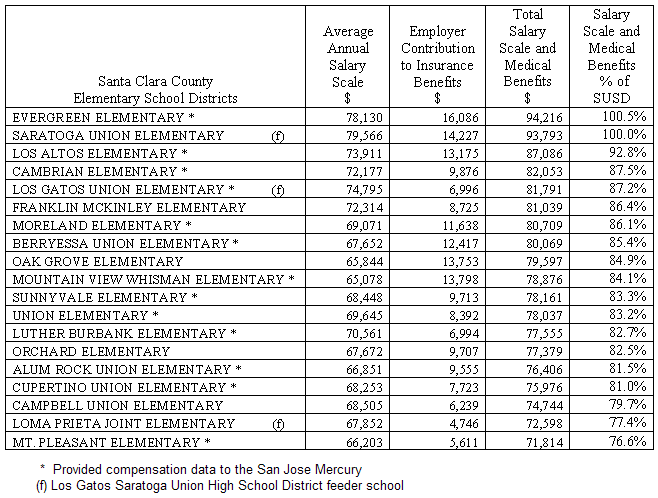 Click here to see which Santa Clara County elementary school districts provided compensation data to the San Jose Mercury) the Supplemental Pay and Retirement Benefits paid by SUSD are not currently available. No doubt, these amounts are greater than $0.00. How much is paid, how these amounts have changed over time and how this compares to other districts is unknown to the public.